Once services are pushed to production their associated WSDL documents – which represent service endpoints, protocols and related contracts describing operations and messaging – must not be changed. Or, at a minimum, any changes should be backward compatible so that existing clients are not affected when changes are published. In this section I will discuss how WCF contracts support backward compatibility, and explain a few versioning strategies that you might consider for your WCF applications. WCF contracts are version tolerant by default. 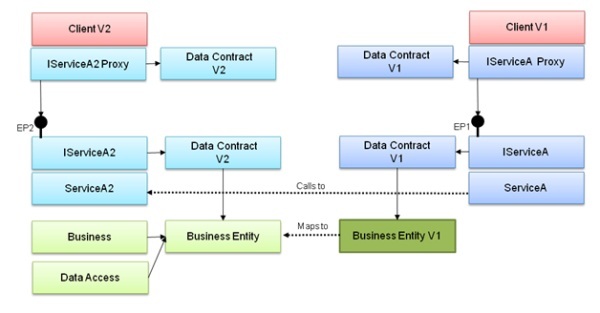 Figure 1 and Figure 2 summarize typical changes to service contracts and data contracts and describe the impact to existing clients. In short, the DataContractSerializer allows missing, non-required data and ignores superfluous data for service contracts, data contracts and similarly, message contracts. Only the removal of operations or the addition or removal of required data causes problems with existing clients. Client unaffected. Superfluous parameters pass by clients are ignored, data lost at the service. If types are compatible no exception but may receive unexpected results. Version tolerance is a good thing since it gives developers a flexible way to handle change. Since the DataContractSerializer is version tolerant, in theory you can refrain from officially versioning contracts and endpoints that expose those contracts until a breaking change is introduced such as removing operations from a service contract, or adding or removing required members from a data contract. If you add new operations to a service contract only clients that reference the latest WSDL will know about those operations and you will not be able to track which of your existing clients have updated their WSDL unless you expose a new endpoint when changes are made. If you add non-required data members to a data contract you may have to write extra code to initialize missing values to something meaningful – as opposed to using the default value. If you remove non-required data members from a data contract you may have round-trip issues where data passed to services or returned to clients is lost. It may be difficult to track problems if you do not keep track of different versions of contracts, as changes are made to production. Agile Versioning: Rely on backward compatibility for as long as possible and avoid formal contract and endpoint versioning until compatibility is broken. This approach is useful in agile environments that require frequent updates to production code. Strict Versioning: Perform formal contract and endpoint versioning for any change to a service contract, data contract, message contract or other contract-related or endpoint-related changes. This approach is best in environments what have less frequent production updates or that require detailed tracking of any and all changes. Semi-Strict Versioning: Perform formal contract and endpoint versioning when contracts or endpoints are modified in a way that your policy requires tracking the change. For example, your policy might be to allow new operations to be added to a service contract, but if any changes are made to existing operations, or if any data contracts change such that they are semantically different, it requires versioning. This approach lies somewhere between agile and strict versioning. The agile approach to versioning – shown in Figure 3 – means making changes to existing data contracts and service contracts without versioning them, or supplying new endpoints. 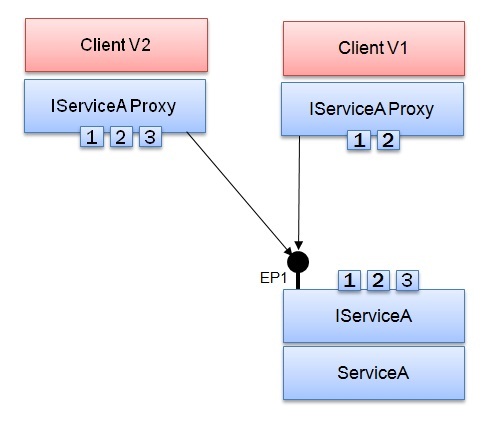 Strict versioning means providing new data contracts, service contracts and endpoints as shown in Figure 4. It is best to decide on a versioning policy before you release the first version to production. Make a copy of the original contract with a new interface type name, the same contract name and a new namespace. Make any required modifications to the contract definition. Implement the new service contract on the same service type if possible. You can use explicit contract implementation to funnel requests to the different method implementations if necessary. Add a new endpoint for the new service contract to the existing <service> configuration. As an alternative, you can use a common base class that implements core service operations and provide overrides in each version’s derived type. This can be a better approach if there are significant changes to the service implementation, or if the service security behaviors will be different from the original service. This will require a separate <service> entry in the configuration file. 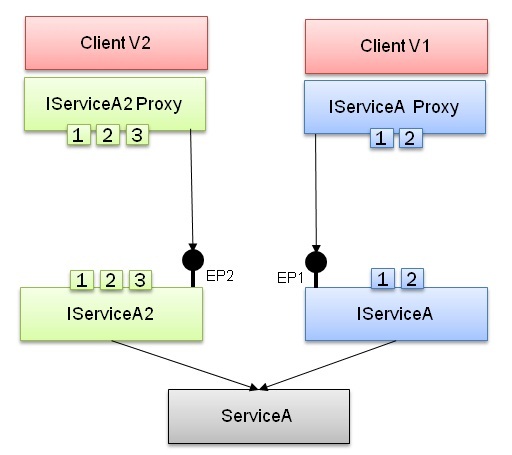 Figure 5 shows an example of strict service contract versioning with a shared service implementation. Note that the Name property of the ServiceContractAttribute is the same for both versions of the contract, while the interface type name changes from IServiceA to IServiceA2. Also notice that two service endpoints are configured – one for each contract. In the accompanying code download for this paper, the following directories contain samples that illustrate service contract versioning: WCFEssentials\ContractVersioning\ServiceContractVersioningAgile, WCFEssentials\ContractVersioning\ServiceContractVersioningStrict. Make a copy of the original data contract and type, but rename the type to V1 since this will no longer be actively used each application tier. Modify the business entity implementation as needed to work with the application, and update its data contract providing a new namespace. Make a copy of the original service contract and implementation and update it to use the V1 type name. Note that this will not alter the service implementation since the V1 type name should have the original data contract with an explicit name and namespace. Version any service contracts that rely on this new data contract following instructions in the previous section. That includes exposing new endpoints. Modify the original service implementation to forward calls to a V2 service instance after mapping the V1 business entity to the V2 business entity. Figure 6 illustrates this approach. In the accompanying code download for this paper, the following directories contain samples that illustrate data contract versioning and IExtensibleDataObject: WCFEssentials\ContractVersioning\DataContractVersioning, WCFEssentials\ContractVersioning\IExtensibleDataObject. Use an agile versioning strategy that relies heavily on backward compatibility for environments that must tolerate frequent change. Use a strict versioning policy for environments that are less frequently updated or require strict change control. Feel free to come up with a customized, semi-strict versioning policy that meets your application's needs. Establish a versioning policy ahead of time so that contracts and endpoints can be defined accordingly. Provide explicit name and namespace properties to contracts to support formal versioning. Implement IExtensibleDataObject on data contracts for clients and suppress support for this at the service.